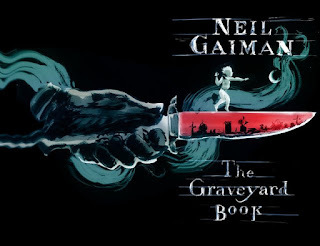 As frequent readers know, I got an advanced copy of The Graveyard Book by Neil Gaiman at BEA. I finally finished it the other day and sat down to write a review of it for this blog, only to realize I’ve never really reviewed a book before. I’m not entirely sure how to do it. I have no actors, designers, or directors to critique. I’ve been writing too many play reviews lately. I feel so unoriginal saying “I liked it”. I can see why reviewers have developed stars, thumbs up, clapping men, tomatoes, etc. I should develop my own, but I’m not sure what it would be. The book is inspired by Kipling’s The Jungle Book, insofar as instead of being about a boy being raised in the jungle by animals it’s about a boy being raced in a graveyard by ghosts. I kept thinking I was missing references to The Jungle Book, but I could be wrong. Looking at a summary on wikipedia, I can’t imagine it really followed along that closely. Still, I suspect someone who’s read The Jungle Book would appreciate The Graveyard Book on a different level. That said I did enjoy it, quite a lot. It does suffer a little from the unavoidable comparisons to Harry Potter (orphaned boy, parents killed, killer still hunting him), but I figure that’s more a result of HP using such a common plot line. I mean, you could just as easily have drawn the comparison to Star Wars (orphaned boy, parents killed, killer hunting him). Still though, the comparison is unavoidable and somewhat detracts. Years from now that will be less of a problem. The tension builds well and has a good payoff. It’s just a “good” payoff. I never quite understood what was living in the barrow or who exactly was trying to kill the main character or why, but it’s explained enough to merit a “good” payoff rating. I even got a little choked up at the very end. Keep in mind, this is a children’s book, and I think children will enjoy it, if they’re not too scared by it. We see the main character grow and learn lessons that young readers can take away with them and apply to their everyday lives. After all, The Jungle Book was used by the Cub scouts to teach morals to urban youth. I don’t know that The Graveyard Book will be similarly adopted, but it’s still a good read.